Tricia Lewis, our Fashion Herald blogger, is out on maternity leave. However, Catherine is pleased as punch to share this offer with you. Old Navy is partnering with One Warm Coat, whose mission is to provide a warm winter coat to as many people as possible. 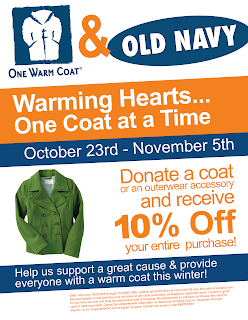 Bring in a coat or cold-weather accessory through November 5th and receive 10% off your entire purchase. Yes, entire purchase. Not just a new coat or scarf - everything! Thanks, Old Navy.